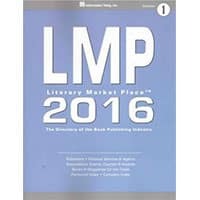 Literary Marketplace (LMP) – This detailed review explores the good and bad about this annual directory. Created more than 50 years ago, this publishing guide is one of the most established literary agency directories on the market. Scroll below to learn more about Literary Marketplace and see a sample literary agency listing. This article is part of a 9-part series to help you decide which Directory of Literary Agents is right for you. Literary Marketplace – What Is It? The Literary Marketplace official description is The Directory of the American Book Publishing Industry with Industry Yellow Pages. The print edition is a staggering 1,833 pages and weighs 7.8 pounds. Literary Marketplace is the directory of America and Canadian book publishing, frequently consulted by practically everyone looking for industry data – whether they are publishing professional, authors, industry watchers, or those seeking to gain entry into the world of publishing. Literary agents and publishing consultants are featured only after we receive three letters of recommendation from publishers active on our database with whom they have worked. Literary Marketplace is the dinosaur of literary agent directories, making it rank at the very bottom of our list. Literary Marketplace contains the least amount of information, yet it’s the most expensive. Subscribers are asked to pay $399.00 US for an annual literarymarketplace.com subscription, or $24.95 US for a weekly subscription. Literary Marketplace includes agents that charge reading fees, a practice that is banned by the Association of Authors’ Representatives (AAR) and frowned upon by most publishing professionals. Literary Marketplace also includes literary agencies that charge higher fees than normal, something else that authors should avoid. The literary agency information provided in Literary Marketplace is also lacking, compared to most directories. And (as mentioned above in the reader review) Literary Marketplace is poorly indexed so it’s very difficult to find literary agents likely to be interested in your book. We DO NOT recommend Literary Marketplace for authors looking for literary agents. Use our Directory of Literary Agents instead. It’s the most comprehensive (and accurate) list of literary agents in the world… plus it’s the easiest to use. Simply enter your first name and email address for free, instant access. General fiction & nonfiction. Handle film & TV rights for book represented; no reading fee. Click here to subscribe to Literary Marketplace online. warning you about using a Free Literary Agents List.